The Yellow Toadstool Leather is a large toadstool or mushroom coral crowned in yellow! The Yellow Toadstool Leather Coral or Gold-Crowned Leather Coral Sarcophyton tenuispiculatum is popular leather coral favorite in the Sarcophyton genus. The Sarcophyton sp. have a thick smooth, single stalk with a flared, smooth mushroom-shaped top that can be folded or funnel-shaped. Depending on the species, younger colonies are mushroom-shaped and mature colonies are more lobed and folded like a toadstool. Some keep the toadstool look their entire life. The flesh is firm and soft, yet can be easily torn. The "top" is called a capitulum and within that area are found autozooid polyps for feeding and siphonozooid polyps for water movement. Like the other members of this genus, the S. tenuispiculatum resembles a mushroom or toadstool. It has a cream colored or tan, thick, smooth, single stalk and the capitulum has a disc or shallow bowl shape that houses tons of yellow, white or green tipped tentacles. Higher lighting can bring out a little brighter versions of color. The polyps can retract all the way, giving it a smooth look. When looking at the capitulum, there is a flatter area in the center with the "folds" being located more toward the edges. The Yellow Toadstool Leather Coral is known by many common names including Gold-Crowned Leather Coral, Lacy-Head Leather Coral, Leather Sponge Mushroom, Leather Cup Coral, Toadstool Coral, Mushroom Coral. Because it is similar in form to other leathers, many of the same common names are used interchangeably such as Toadstool Leather Coral, Toadstool Mushroom Coral, Toadstool Mushroom Leather, Mushroom Leather Coral, Umbrella Coral, Sarcophyton Coral, and Mushroom Coral. When ordering this or any other leather coral, its best to make sure you use the scientific name. The Yellow Toadstool Leather Coral is easy to keep and propagate, making it a great coral for the beginner. They like a low to moderate water flow and high lighting. For nutrition they use the symbiotic algae, zooxanthellae, that lives within their tissue, as well as extracting nutrients from the water. They do grow large and are very aggressive towards other corals, so they need plenty of space. This is one of the hardiest of corals, yet the firm soft flesh of the Yellow Toadstool Leather Coral is easily torn. Also the Sarcophyton corals tend to produce a lot of toxic compounds compared to other leathers. They are toxic toward other corals due to their release of terpenes (poisons used to ward off encroaching corals). With the production of toxins and the delicate nature of its flesh, care must be taken when handling this species. The Yellow Toadstool Leather or Hardy Leather Coral is found in subtropical and tropical waters making them a great candidate for cool water and warm water reefs! Want large angelfish? No problem! They will not bother your leather because of the noxious toxins they emit. While fish are not affected, hard corals have been known to stop growing or die in the same tank. This may be okay in a tank that is hundreds of gallons with media designed to remove impurities from the water. Tank size needs to be several hundreds of gallons as these corals grow almost 20" across. Leather Coral Information: The Sarcophyton genus was described by Lesson in 1834. They belong to the family Alcyoniidae, which are referred to as octocorals. There are over 35 species of Sarcophyton. Some of their common names are Toadstool Leather, Toadstool Mushroom Coral, Leather Coral, Mushroom Leather, Toadstool Mushroom Leather, Umbrella Coral, Sarcophyton Coral, and Mushroom Coral. The Yellow Toadstool Leather Coral S. tenuispiculatum was described by Thomson and Dean in 1931. This leather has many names similar to other leathers such as Gold-Crowned Leather Coral, Lacy-Head Leather Coral, Leather Sponge Mushroom, Leather Cup Coral, Toadstool Coral, Mushroom Coral. They have been propagated in captivity, but since they tend to be rather bland in color, many times these corals are dyed. Dyed corals tend to not do as well and are dyed because the areas some come from have been bleached due to pollution and weather patterns. Where Sarcophyton Corals Are Found: The S. tenuispiculatum are found in the Red Sea and Indo-Pacific. Sarcophyton Coral Habitat: The S. tenuispiculatum inhabit reef flats and lagoons with hard and soft coral species. Like others in their genus, they siphon water and utilize the nutrients for growth. The Sarcophyton tenuispiculatum is not listed on the IUCN Red List for Endangered Species. In varying amounts, depending on the species, Sarcophyton leathers will warp their upper surface and direct the water flow by forming ridges that lead to feathery pinnules on their tentacles. These feathery pinnules are designed to sieve the water for nutrients. The capitulum (top) has autozooid and siphonozooid polyps that are rather long when extended. When the polyps are completely retracted, the surface has a very smooth look to it. The capitulum of the Yellow Toadstool Leather Coral S. tenuispiculatum has a flatter area in the center with the "folds" being located more toward the edges. It has a cream colored or tan, thick, smooth, single stalk and the capitulum has a disc or shallow bowl shape that houses tons of yellow, white or green tipped tentacles. Higher lighting can bring out a little brighter versions of color. It is firm and soft, yet easily torn, so care should be taken when handling it. The S. tenuispiculatum can grow to 19.5" (50 cm) in diameter in captive systems, and once at a larger size, the very thick stalk makes them easier to identify. Leather Coral Care: The Yellow Toadstool Leather Coral S. tenuispiculatum is very easy to keep and propagate, making them a great coral for the beginner. They like a moderate water flow, medium to high lighting, and for nutrition they use the symbiotic algae, zooxanthellae, that lives within their tissue, as well as extracting nutrients from the water. They do grow large and are aggressive if allowed to touch other corals, so be sure to leave enough room between species. The flesh of the S. tenuispiculatum is firm and soft, yet can be easily torn. It also tends to produce a lot of toxic compounds compared to other leathers, so care must be taken when handling. It is common for the S. tenuispiculatum to retract their tentacles and develop a waxy look on their surface which is a periodic sloughing of the top layer of the skin. You can aid in the shedding by directing water flow for a short time to help whisk the mucus away. Leather Coral Feeding: The Sarcophyton leathers have reduced digestive systems. They do not use mucus nets, nor are their tentacles designed to catch prey. To make up for this, they will warp their upper surface and direct water flow by forming ridges that lead to feathery pinnules on their tentacles. These feathery pinnules are designed to sieve the water for nutrients. They can also absorb dissolved organic matter, and have a symbiotic relationship with a marine algae known as zooxanthellae, where they also receive some of their nutrients. Because these corals are photosynthetic, they receiving nutrients from the marine algae, zooxanthellae, that lives within their tissue so really do not need to be fed in mature systems. For maximum growth, more intense lighting is needed since this type of coral thrives on light, which supports its zooxanthellae. Though it is often stated that the Yellow Toadstool Leather Corals do better in tanks that have regular feedings, it is not because they benefit from direct feeding. Their digestive anatomy has not developed to capture larger foods (even "sand" sized). But with feedings of other corals, extra nutrients are inevitably added to the water and in turn do benefit this coral. The feathery pinnules at the top of their tentacles will sieve nutrients out of the water. These nutrients are especially important if the light is not on the higher end. Stable tank conditions are needed to keep the Sarcophyton genus. A water change that is a standard for any reef system, not to exceed 30% is needed. In general, a typical water change of 20% a month or 10% biweekly, depending on the bio load, is sufficient. Some have found success by doing a 5% water change once a week, keeping water quality high and reducing the need for most additives. Soft corals do need to have proper chemical levels for good growth. Iodine is used up quickly in captive environments, and does need to be added to the top off water or to the tank regularly. Make sure you have a test to make sure your levels are sufficient. Frequent water changes are preferred over adding supplements other than those listed here. A typical live rock/reef environment is what is needed for your Yellow Toadstool Leather Coral, along with some fish for organic matter production and plenty of room to grow. Provide proper lighting and water movement. They need a low to moderate water flow and they like moderate to high lighting. Make sure the water flow does not shoot a straight hard stream directly at the coral, only random water current. The Sarcophyton genus is very aggressive toward other corals, like stony corals, so be sure to provide plenty of room between these and all other species. Water Region: All areas of the aquarium. The Yellow Toadstool Leather Coral is very aggressive. The S. tenuispiculatum is toxic toward other corals due to their release of terpenes (poisons to ward off encroaching corals). They have been known to harm some stony coral species of Acropora like the Staghorn Acropora A. formosa, some species of Porites like P andrewsii, as well as the death of Catalaphyllia, Euphyllia, and Plerogyra species. 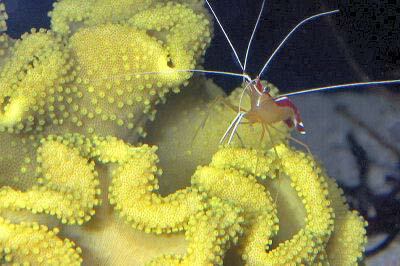 This species can generally be housed with fishes, shrimp, and hermit crabs. Be careful if a clownfish decides to use a S. tenuispiculatum as a surrogate anemone. The irritation of the clown can prevent the coral from expanding. In this case removal of the clown, or screening off the coral from the fish may be needed. There are also several species of flatworms (planaria), nudibranchs, and other parasites that tend to feed on its tissue. If these pests are present, they can usually be removed with a simple 5 minute freshwater dip. Males tend to be smaller than females, reaching 4 x 4 x 4" (11 x 11 x 11 cm) and become sexually mature in 6 to 8 years. The females will reach 24 x 24 x 24" (61 x 61 x 61 cm) and they reach sexual maturity at 8-10 years. In the wild, the Sarcophyton genus will reproduce naturally by spawning as well as by budding and fragmenting. They will drop off clones of themselves by self fission. A sign of reproduction is a hole that may appear in the middle of the capitulum, and as it reaches the edge, a small piece falls off. As can be seen in the photo this coral is reproducing by "budding" in which a small coral grows from the base and starts its own coral. The "bud" can be severed from the parent coral at this point and glued to its own rock. The Yellow Toadstool Leather Coral is very easy to propagate, for just a small piece or for a large frag, but with a few variations in procedure. Using either procedure, the coral will more than likely deflate, but with good water flow it will recover. Corals can emit a nasty and at times noxious odor, so be sure there is good ventilation. Clean up any mucous when finished to prevent any possible health problems. Simply cut a small forked frag (1-2" frag size) away from the mother colony while still in the tank. The frag can be glued, tied, sewn to a rock or plug, or just set on rubble where the current will not take them away, but will help them heal. Return the leather to the same spot it was in before fragging and discard bath water.This placement will depend on the size and shape of the frag. At the very minimum place it at least close to where the mother colony is located, perhaps using the mother colony to block a water flow that is too quick for the frag. The Sarcophyton genus is generally very hardy and adaptable, but can contract disease. Coral diseases are commonly caused by stress, shock (like pouring freshwater into the tank and it coming in contact with the leather), and incompatible tank mates including specific fish, or pests such as a Rapa rapa Snail which will eat them from the inside out. If the coral goes limp for a prolonged period of time, lasting over a week, there may be underlying conditions such as poor water quality, a predatorial snail, or a nearby coral starting chemical warfare, competing for room. Look for rotting tissue and holes that will show up under the capitulum. If the coral sheds for a prolonged period of time, aim a powerhead or return flow at the leather to clear off the mucus. Soft Corals for Sale: The Yellow Toadstool Leather Coral S. tenuispiculatum is very easy to find pet shops and on line. Online they can run about $48.00 USD or more, depending on size and/or color.